Mr Mawuli Avutor, the Deputy Director of the Commission for Human Rights and Administrative Justice (CHRAJ), has urged teachers to find other alternative forms of correcting children in school rather than caning. 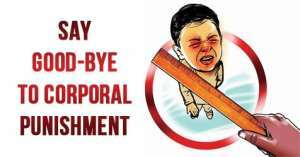 He said caning was a corporal punishment, human right abuse of the child and a negative development to children's education as they suffer torture and physical trauma. He recommended cleaning, reading, desilting of gutters among others to be the punishment to children in school. Mr Avutor gave the advice during the Parent-Teacher Association meeting organised by the Osagyefo Leadership International School at Labone in Accra. The meeting was to inform the parents on the ban on corporal punishment (caning) in basic and second-cycle schools and by the directive of the Ghana Education Service (GES) it was illegal and would not be tolerated in any form. Mr Avutor said over the years, corporal punishment had not proven to be the best mode of correcting the erring child but rather there was ample evidence to proof that children who had been subjected to prolonged corporal punishment during their formative years ended up becoming violent themselves. 'Such children see violence as the only way of resolving any problem and might end up engaging in more serious social vices such as armed robbery,' he said. The Deputy Director said there was the need for Ghanaians to sensitise on the harmful impact of corporal punishment so that they could come up with other forms of punishment to mould the child to become responsible adults. She said Ghana had signed all the protocols and instruments that stated that corporal punishment should be abolished and called on all and sundry to report schools that flouted on the directive to the GES. Mr Seth Korgah, the Headmaster of the school said the school was ready to crack the whip on any teacher who violated the directive, adding that in the past, prior to the issuance of the directive, any teacher who misconducted himself by corporal punishment was sanctioned severely.